Why should Wu Ruofu replay the worst experience of his life when he can get Andy Lau to do it for him? Instead, he takes on the part of the police chief scrambling to rescue the kidnapped actor. It might sound slightly meta but the drama is as gritty as it gets in Ding Sheng’s Saving Mr. Wu (trailer here), which opens this Friday in New York. Although Wu (scrupulously referred to as “Mr. Wu” throughout the film, in Dragnet-Naked City-style) is a Mainland actor primarily known for television, he is reinvented here as a Hong Kong leading man movie star and former Cantopop idol, to capitalize on the Lau persona. However, the basic arc is reasonably faithful to the actual incident. While coming out of a Beijing karaoke club where he had been celebrating with a producer, Wu is kidnapped by a gang impersonating police officers. Frankly, Wu is never really fooled by them. After all, he has played plenty of cops in action movies. However, Zhang Hua and his accomplices have superior numbers and arms. Clearly, Zhang is not as smart as he thinks he is, because Xing Feng and his boss, Captain Cao Gang (portrayed by the steely-looking Wu himself) manage to capture him. Unfortunately, they have not discovered his hideout and they suspect Zhang left orders to kill Wu by a certain time. Thus Saving unfolds in a split narrative, as the kidnapping drama catches up with the cat-and-mouse game playing out in the interrogation room. Normally this sort of flashing-back and flashing-forward structure is just asking for trouble, but Ding maintains such tight control over the temporal shifts, they actually help build suspense. It also facilitates the ironic juxtaposition of Mr. Wu wrapped in chains and the apprehended Zhang ensconced in an iron maiden-ish contraption that looks like it would give Amnesty International a cow if it were used in any other country besides China. When you watch Lau in Saving, you realize he is not one of the world’s biggest movie stars for nothing. This is a subtle, slow-burning performance that sneaks up and coldcocks you. Watching him protect Xiao Dou, a fellow kidnapping victim who was in the proverbial wrong place at the wrong time becomes seriously poignant. Conversely, Wang Qingyuan is massively creepy as the cruel and erratic Zhang. With him, every twitch screams trouble. Frankly, as Gang, the real Wu is so hardnosed and grizzled, it seems strange that he has not made more films—or that anyone would want to try their luck kidnapping him. As an extra added bonus, Lam Suet appears as Wu’s trusted army buddy Mr. Su, playing it totally straight, but still showing the dynamic presence that enlivened so many Johnnie To films. 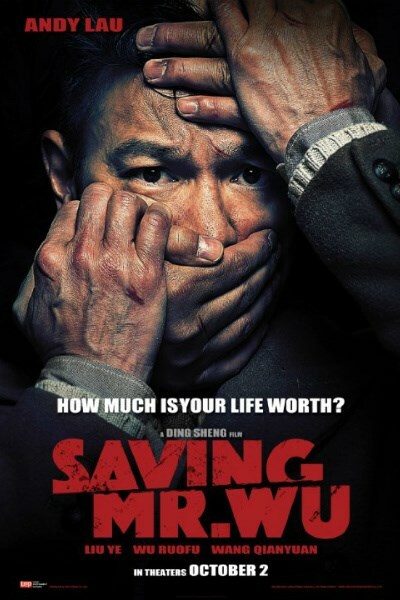 Saving is a tight, tense ripped-from-the-headlines thriller that gets shockingly mature and emotional in its climatic moments. Ding’s Police Story: Lockdown is far better than its reputation suggests (honest, it is), but this film should take him to the next level—and pretty much keep Lau at the top. Gripping and unusually satisfying, Saving Mr. Wu is highly recommended for all fans of procedurals when it opens this Friday (10/2) in New York, at the AMC Empire.